The International Monetary Fund (IMF) projects that Ghana’s economy will grow 7.5 percent in 2017 as the Tweneboa, Enyenra and Ntomme (TEN) oil field begins full production. 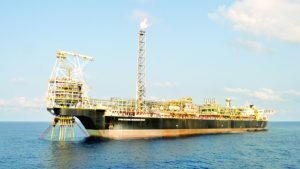 To date, the Tweneboa, Enyenra and Ntomme (TEN) field has produced about 800,000 barrels of oil, and the gas export to the Gas Processing Plant (GPP) is expected to begin in the 1st quarter, 2017, the Minister of Petroleum, Emmanuel Kofi-Armah Buah has said. According to the IMF, Ghana is projected to enjoy a growth fillip as the new field coming on line is expected to boost oil production by some 50 per cent, increasing overall growth to 7½ percent. “However, the rest of the economy will continue to expand at a much slower pace,” the Fund said. On the overall economy of countries in the sub-Saharan region, the IMF said among those countries in which inflation has been high recently, it is expected to moderate to about 10 percent in 2017 in Ghana from about 17 per cent currently on tight monetary policy, and in Zambia from 19 percent to 9 percent owing to base effects. By contrast, inflation would remain stuck at high levels in 2017 in Angola (38 percent) and Nigeria (above 15 per cent), as depreciation pass-through and foreign exchange shortages feed into prices in a context of an overly accommodative monetary stance, the IMF pointed out. It further indicated that growth in sub-Saharan Africa looks set to slow to its lowest level in more than 20 years. With lower commodity prices and a generally less supportive global economic environment, average growth in the region is foreseen to decelerate sharply to 1½ percent this year—well below population growth, and in sharp contrast to the high growth rates of the past 15 years. “While the projection is for a modest recovery for next year (to nearly 3 per cent), this is predicated on prompt action to address the large macroeconomic imbalances and policy uncertainty in some of the region’s largest economies. This aggregate picture, however, belies considerable heterogeneity in economic paths across the region,” it said. The Fund also noted that most of the non–resource-intensive countries—half of the countries in the region—continue to perform well, as they benefit from lower oil import prices, an improved business environment, and continuous strong infrastructure investment. Countries such as Côte d’Ivoire, Ethiopia, Kenya, and Senegal are foreseen to continue to grow at more than 6 percent. In contrast, commodity exporters are under severe economic strains, including the region’s three largest countries, Angola, Nigeria, and South Africa. The near-term prospects of oil exporters, in particular, have worsened, notwithstanding the modest uptick in oil prices, as the slowdown is becoming entrenched—activity among these countries is expected to contract by 1¼ per cent this year. It added that, among other resource intensive countries, growth in the Democratic Republic of Congo, Ghana, South Africa, Zambia, and Zimbabwe is decelerating sharply or stuck in low gear. “Policy adjustment among hard-hit countries needs to be enacted promptly to allow for a rebound in growth. Worryingly, in the face of strong financial and economic pressures, the policy response in many of the hardest-hit countries has been slow and piecemeal, often accompanied by stopgap measures such as central bank financing and the accumulation of arrears, and leading to rapidly rising public debt,” it said. In oil-exporting countries with flexible regimes, it said, exchange rates have been allowed to adjust only with reluctance, resulting in strong pressures on deposits and foreign exchange reserves. As a result, the delayed adjustment and ensuing policy uncertainty have been deterring investment and stifling new sources of growth—making a return to strong growth rates more difficult. Instead, it adds, a sustained adjustment effort is needed, based on a comprehensive and internally consistent set of policies. “This implies fully allowing the exchange rate to absorb external pressures for countries outside monetary unions, reestablishing macroeconomic stability—including by tightening monetary policy where needed to tackle sharp increases in inflation—and focusing as much as possible on growth-friendly elements of fiscal consolidation. With limited buffers, the scope to ease the adjustment path will depend critically on the availability of new financing, ideally on concessional terms,” it said. It noted among others, that countries that are still growing rapidly should rebuild buffers in comparatively favourable times to stem the increase in public debt.